H�kan, well it looks like half face Nelson, now has a very beautiful engine to ride around in now. Nice work, despite all of the problems that you experienced getting this one across the finish line. I would love to see one day, a photo of all your beautiful engines all lined up together, for a family portrait at your turntable & engine house. Love the engineer, he has real character! The whole loco looks great!!! Beautiful work. 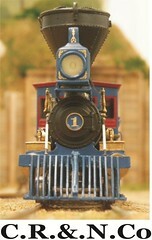 A very elegant locomotive in its lines and paint. Much cosy tonight so I haven't had time at the computer until now. Thanks Bob, a quick fantasy to cover up a dreadful face. Thanks Greg! I'll take you up on that idea. Thanks for the kind words Dave! A note on the beard. It did not come with the model and was made mixing black acrylic paint with artist modeling paste and then painted on. Thanks Carl and Michael. I hope it came out fairly close to the Eureka. Sorry, but I can't stand so see such excellence slip to page two! No I'm not dead or in coma It has only been intense with our newborn so the precious leasure time there is has gone exclusively to modeling. But still there has been some progress on the layout and on the modeling front. I'm finishing my trestle at my gorge area and the gorge is now breached. Lots of boring rockwork still to do before I'm over the mountain. I'm trying to carve my own rocks as my creativity with the rockmolds are running out. Here is a photo of the progress sofar. On the locomotive front I have somewhat "pimped" a Bachmann new tooling 4-4-0 with new livery, pilot, smokestack and headlight. As I bought it without decoder I fitted a Soundtraxx Econami in it. It runs very good with only a very slight wooble. I have quite a few of the new Bachmanns and not one of them runs perfect. I have various theories on what is the culprint and at the moment one of them is that the gears are out of center on their axles. The other loco I'm working on is a Sunset GN F-1 Brooks 2-8-0 that I'm backdating to as built 1893. The major change is a new wood cab and getting rid of a lot of details. I have just tweaked the mechanism so it now runs well. It will with the exception of the compound cylinders hopefully look as on the photo below. Other than that I have finished an old plastic wagon kit from Glencoe kit. The bulls where too small in the kit but I found two HO ones which had harnasses in the scrap box. And I'm working on a new kit, a mud wagon. It will be cut in laserboard. Here is a photo of the first prototype. All is looking sooo Good. You have some serious air under that trestle too. Good call on the oxen. Goliath look sharp, though I think she's misnamed. 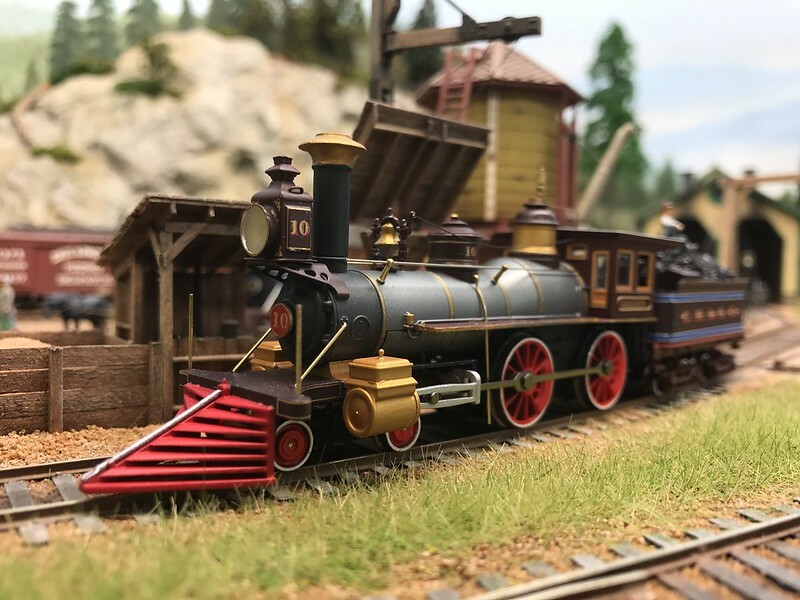 How does the pulling power of your Bachmann compare to your brass Americans? Did you add additional electrical pick up? I'm sure the F-1 will be a beauty of a beast. Well Hello H�kan, sounds & looks like you have been a very busy man! Congratulations! On the birth of your new little tax write off! I hope the new little one(Boy or Girl?) and Mom are doing well. Great to see you and your modeling work return here to the forums. 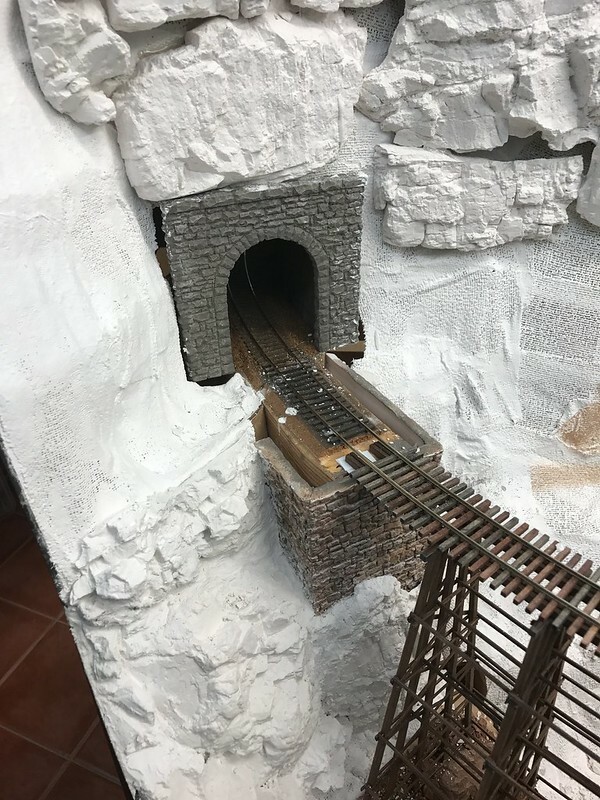 Your new curved trestle and troublesome rockwork look great. As do your newest additions to the engine fleet. 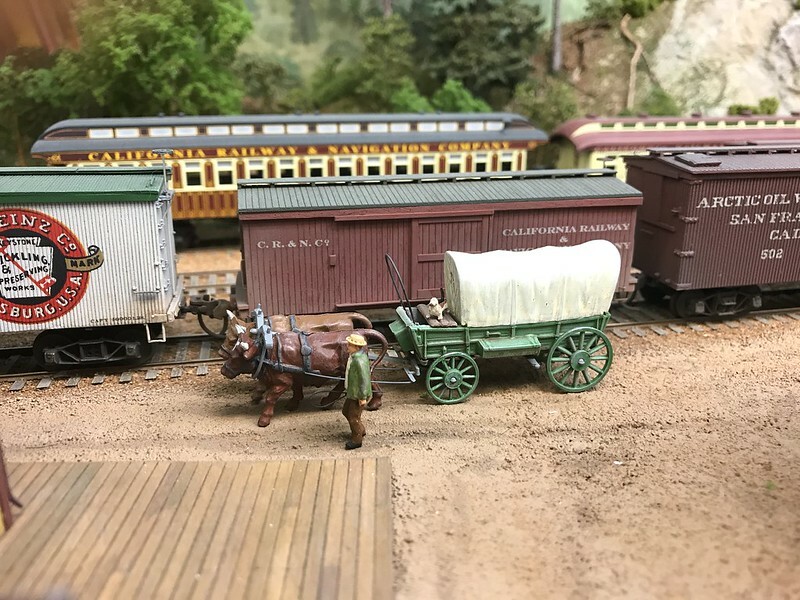 Also that Glencoe wagon kit looks very nice, no bull. And your so called "Mud wagon" prototype looks even better. Have I missed something, are you getting into the kit making business? I thought I was the only one crazy enough to try that. Best of luck with it, if you are. Hello H�kan, CONGRATULATIONS on the new member of your family! Even with that new addition you have still managed to do more modeling than I have lately. 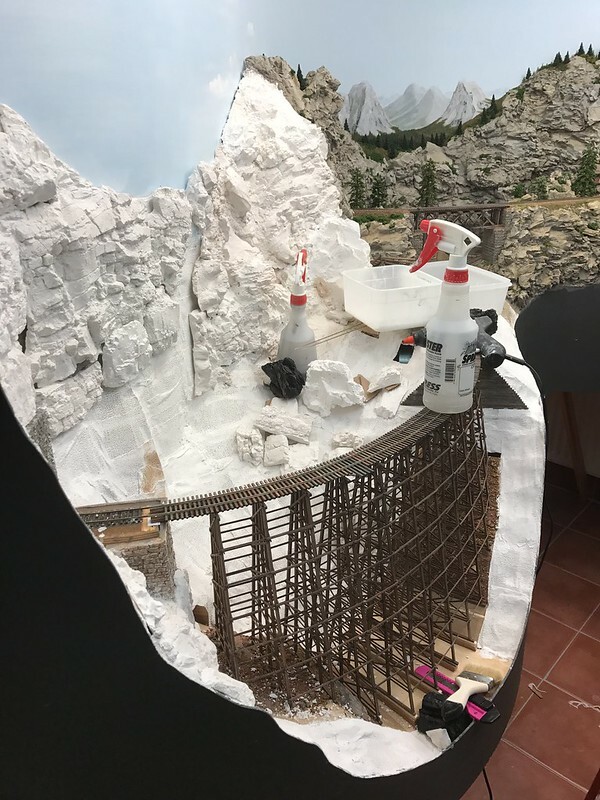 I am eager to read what you discover about the source of the Bachmann wobbles because a friend is just string to work on a Civil War layout and is looking at the locos as his prime source of motive power. H�kan, beautiful trestle and congratulations on the baby. It's great seeing some new photos of your work. And congratulations on the new member of your family. Oxen of course! Sorry for the bull. Thanks Bob! Goliath misnamed? She is a large beast. Ok she was some decades ago when they named her anyway . The Bachmann can pull as much as the brass ones if one keeps the traction tire clean. I have also added additional weight to it and pickup on the tender. Thank you Greg, it�s a he named Anton. All are doing well. He came last summer and now is 11 months old and beginning to walk. Well learn to stand up anyway. You can imagine how much he needs to be looked after. I�m on parental leave for a couple of months and my wife has gone back to her work. So it�s I doing the domestic stuff at the moment. Except for washing, as I have botched up to many times with pink and shrinked shirts. To put it mildly one can say it�s a contrast to being at work. 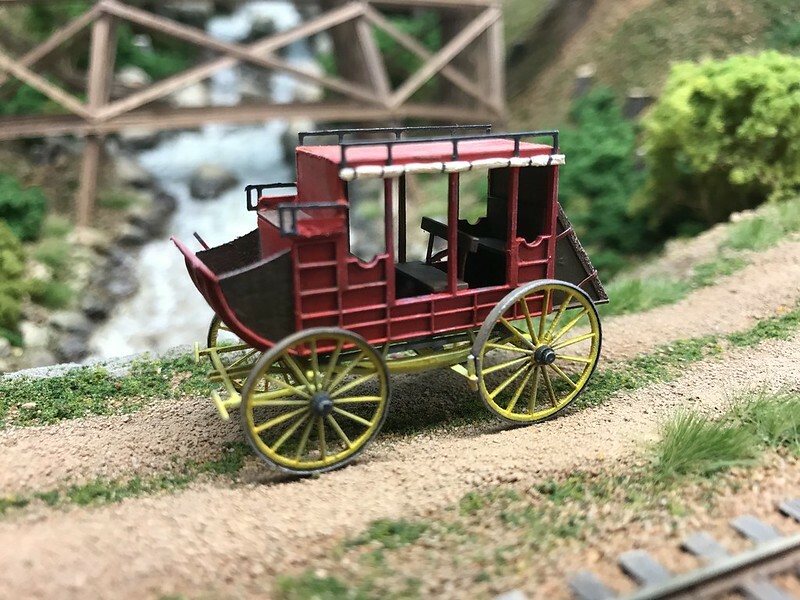 On the mud wagon I have been making kits (I�m terminal crazy I know) for awhile now, two sleeper cars a Woodruff sleeper and a Pullman palace car in HO. Bob built the Pullman in his thread. 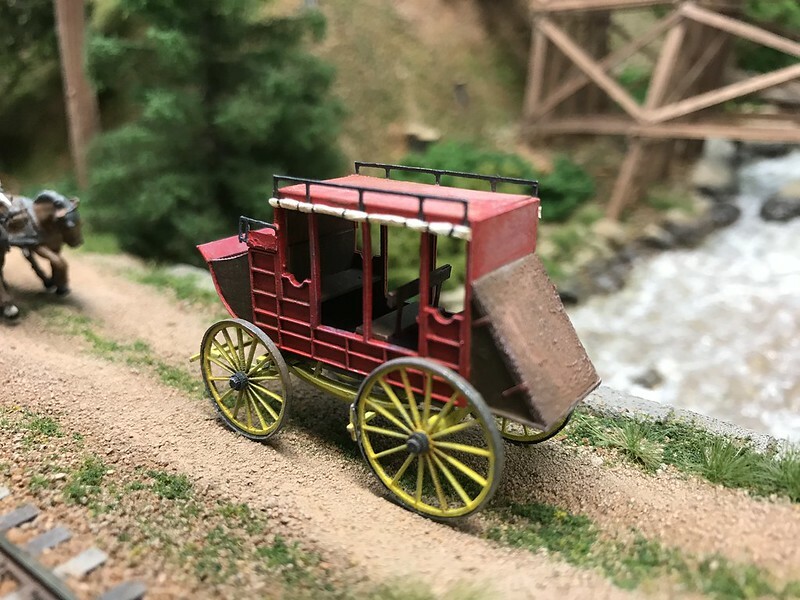 The mud wagon began as a fun project for the laser. I don�t know of any manufacturer that has done one in HO or any other scale for that matter. The mud wagon is quite boxy so it lends itself great to laser cutting. BUT I have missed something. You are into the kit making business Greg? I have so much to catch up on the forum. Thanks Bill! He likes being with me in the basement sitting in a babychair playing with his own stuff. He has patience for 15-20 min and one can do a lot of stuff then. But using chemicals is a problem and that I can only do that when my wife is back and she can watch him as I don�t want to expose him to the vapours. On the Bachmann. Don�t get me wrong, the model I have all runs very nice smooth both forward and backwards. The only thing I don�t like is that some of them wobbles. I can be I who have had bad luck with my purchases. My theory is aside from the gears being out of center that it can be a combination with not uniform traction tires and wheels also not centred. With bad luck these things can converge and give exaggerated woobles. On one I changed the traction tire to a new one from Marklin and it ran much better. BUT I still must recommend the locos. They are very good value and if one is just take care getting a good running one from the dealer then you will be happy with the purchase. Thank you Mike! It�s great to be back. I�m happy you like it Frank! 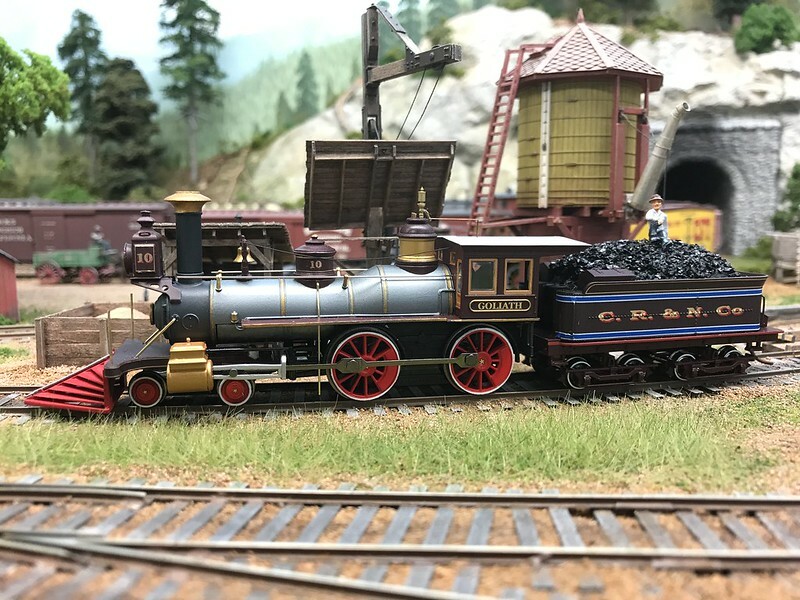 Your rocks, new kits and locomotive all look fantastic, as usual! Great to see you back here, and we can certainly relate to the little one changing your life forever.